Delicious Mango Delight recipe by Annie Khan at PakiRecipes.com. Delicious combo of icecream, mango and nuts. 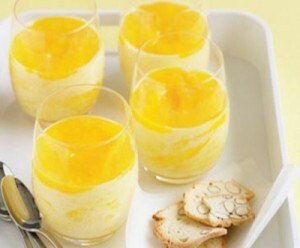 Just pour the mango syrup in long glasses and then add a little quantity of nuts in it. Then add a scoop of creamy ice cream in every glass and a tsp of sugar on it. You may then add nuts on top alongwith the chocolate bits on top. This is to be served cold.